Now that the year 2010 has begun, a new stamp program has been launched by Canada Post. 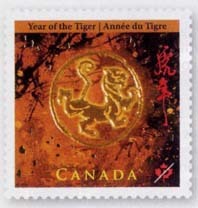 On January 8th, 2010, Canada Post began issuing a stamp marking the Chinese New Year. The stamp and souvenir sheet feature a stylized tiger whose design relies heavily on traditional Chinese imagery, along with gold accents. This is the 14th year in a row that Canada Post has issued a stamp commemorating the Lunar New Year. Often a favourite with collectors due to the intriguing designs and use of colour, this year’s stamp will surely be a hit once again! The souvenir sheet once again features a scroll design. This is one ugly stamp! I do not agree with u guys. That is the real art with the specail shape.